Prévision des crues éclair -Valérie Estupina Borrell, Jacques Chorda, Denis Dartus. Contribution de l'hydrogéomorphologie à l'évaluation du risque d'inondation : le cas du Midi méditerranéen français -Jean-Louis Ballais, Gérald Garry, Marcel Masson. Estimates of present-day erosion based on sediment transport in rivers: a case study in Taiwan -Fung-Chun Li, Jacques Angelier, Rou-Fei Chen, Hui-Ming Hsieh, Benoît Deffontaines, Ching-Ruey Luo, Tso-Tchang Wu, Ming-Chao Lin. Monitoring coastal evolution and associated littoral hazards of French Guiana shorcline with radar images -Hervé Trebossen, Benoît Deffontaines, Nicolas Classeau, Jacob Kouame, Jean-Paul Rudant. Coupling between hydrogeology and deformation of mountainous rock slopes: Insights from La Clapière area (southern Alps, France) -Yves Guglielmi, Frédéric Cappa, Stéphane Binet. Large earthquake-triggered landslides and mountain belt erosion: The Tsaoling case, Taiwan -Rou-Fei Chen, Yu-Chang Chan, Jacques Angelier, Jyr-Ching Hu, Chung Huang, Kuo-Jen Chang, Tian-Yuan Shih. Monitoring vertical deformation due to water pumping in the city of Paris (France) with differential interferometry -Bénédicte Fruneau, Benoît Deffontaines, Jean-Paul Rudant, Anne-Marie Le Parmentier. 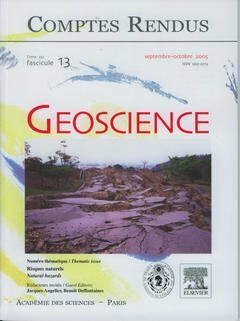 Estimation of subsidence using GPS measurements and related hazard: the Pingtung Plain, southwestern Taiwan -Chin-Shyong Hou, Jyr-Ching Hu, Li-Chung Shen, Jing-Suei Wang, Chien-Liang Chen, Tien-Chang Lai, Chung Huang, Yi-Rong Yang, Rou-Fei Chen, Yue-Gau Chen, Jacques Angelier. Neotectonics and seismic hazard assessment in Hengchun Peninsula,southern Taiwan -Claudio Vita-Finzi, Jiun-Chuan Lin. Monitoring active fault creep as a tool in seismic hazard mitigation. Insights from creepmeter study at ChihshangTaiwan -Jian-Cheng Lee, Jacques Angelier, Hao-Tsu Chu, Jyr-Ching Hu, Fu-Shu Jeng. Review on the use of natural cave speleothems as palaeoseismic or neotectonics indicators -Éric Gilli. The effects of layering and local stresses in composite volcanoes on dyke emplacement and volcanic hazards -Agust Gudmundsson.